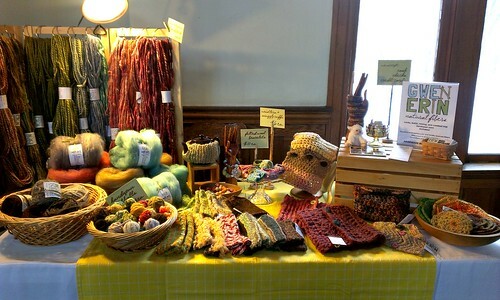 Despite the weather, I had a nice time at the Winter Market last weekend held at the B&O Station in Youngstown. I’ve been purposely building up my home base and it seems to be working! Along those lines, I will be setting up this weekend at the Good Life Fest at the Calvin Center, just down the street. 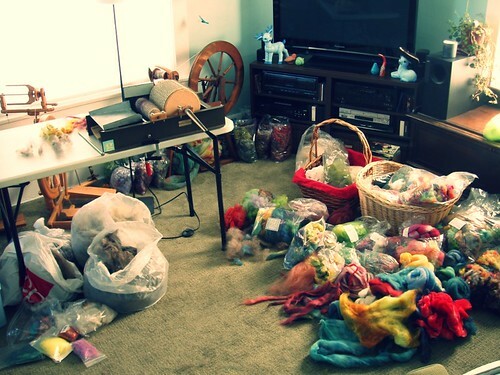 In addition to what you see below, I’m going to bring more of the “yarn show” inventory, such as spindles, Eucalan, etc. Remember that lovely, natural, spindle-spun Shetland I blogged about a few weeks ago? I finally got around to knitting it! I started it last Sunday while I was at the Winter Market. All afternoon I would knit a bit, count, and realize I had messed up. It’s actually a very easy pattern, but I was distracted by shoppers and the constant picking up and putting down of it. Once I had the opportunity to focus a bit, I made a lot of progress and now it’s almost done! 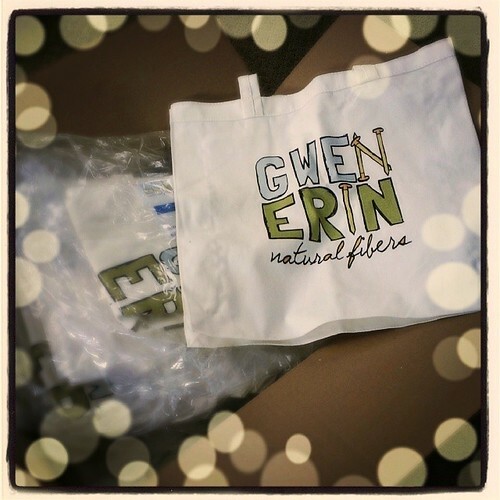 I am super excited about the new GE logo tote bags that arrived last week! I’ve wanted to have a nice thank-you gift for my big spenders, plus I have to admit a bit of envy when I see shoppers carrying around logo bags for other businesses. After shopping around a bit, I ended up having these done by VistaPrint since I could get all the colors instead of just one. They are $10 each, but if you spend $75 or more, you will get one for free! They are not available for purchase in my Etsy shop because I’m not sure if I am “allowed” to sell them there or not. Do they even have rules anymore? However, if you really want one and will not be at any of my shows, please send me an email and I will get one out to you! Speaking of Etsy, if you feel the desire to make a purchase in my shop this month, use the coupon code YarnSchool to get free shipping. I decided it was time for some continuing education (and inspiration), so I signed up to attend Yarn School in Harveyville, KS at the end of April. I was worried that it might be just beginner stuff, but then I was reading on the Ravelry group about how many people go back again and again. It can’t be too dull/easy/basic then, right? I’m excited to get out of my corner of Ohio and see a new state! I’ll be flying out there alone, which is an adventure all on its own. And I’ll have to be friendly all weekend. I think that is scarier than flying! I tend to get weird and distant in situations like that (roommates, group lunches, chatty classes, socializing with strangers). Let’s just hope I can keep my mouth shut and learn something new! Somehow I am not over-thinking this project and it feels so good! That giant pair of mittens inspired me on to create a pair of tube socks, so before the enthusiasm wore off, I pulled out my stash of commercial yarn. When I found several skeins of Brown Sheep Co. Lamb’s Pride, I got even more excited. 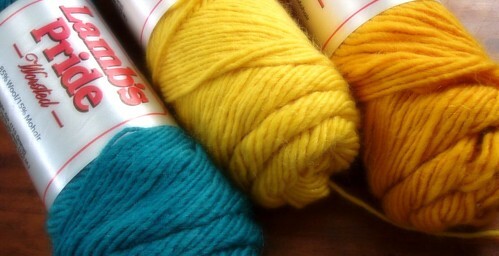 I decided on two shades of yellow plus turquoise. Next it was time to get down to the knitting. Before long I had a rather long tube, but I realized that it was going to look pretty dumb on my foot not having a heel. Then, as if she could read my mind, April suggested the afterthought heel! My previous experience with this heel was not stellar, but it was also at least five years ago. I’d like to think I have improved since then, so I was willing to give it another try. However, I had knitted past the location where the heel should go and I didn’t want to rip out stitches. That is when I came across these instructions from the Yarn Harlot. An afterthought heel from Elizabeth Zimmerman that is truly, 100% an afterthought. Knit the tube, decrease for toes, decide where to put the heel, snip, make heel. Whoa! My mind is blown! I am going to try this. Hopefully it won’t end in tears because I am really pleased with the way my tube looks right now. Then I found that April has even better instructions on her blog, so I am feeling more confident to attempt it. I think I really needed this project. I haven’t completed a pair of socks in ages. Nearly a year ago I lamented this fact, though I never went further than that. Also, the vibrancy of these colors is really lifting my spirits. Northeast Ohio has a reputation for being grey, but we have had so many days of solid overcast weather, that I may have forgotten what the sun looks like. This will be the type of project that, although it may not be very challenging, will give me a great deal of pleasure and satisfaction. Just a few days till we board our time machine and head back into the 12th century (or something like that). 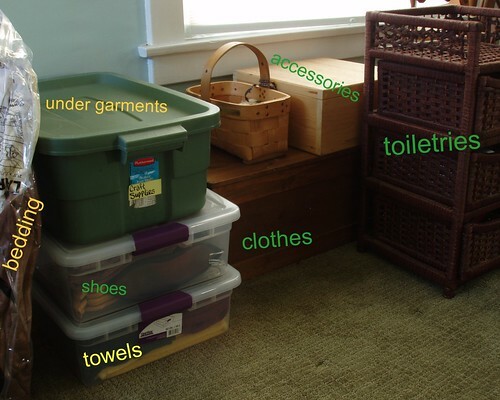 I’ve been packing up various items such as clothes, shoes, towels, toiletries, bedding, food. I am responsible for everything “in the house”. Rich takes care of the big stuff that lives in the garage. Before I can pack the stuff that needs to go, I have to unpack what remained from last year. Some thoughts that run through my mind as I pack: what is this? Do we need this? Did I wear this last year? Will I wear it for the first time in 7 years if I bring it? We’ve never used this. Where did this come from? No wonder this box is so heavy, it’s full of metal spear tips. It’s hard to pack light since we take a lot of the camp’s gear, like the shower and water system. This year we have a beautiful new shower floor and fixtures. I’m sure it will be disgusting in mere days (hard water deposits). Now that all the obvious things are packed, I have to address the most difficult portion: projects. Over the years (9 of them) I go back and forth between bringing lots to do and bringing very little to do. It gets hot there and sometimes all you really want to do is lay around and fall asleep, not have wool in your lap. Other times you’re busy visiting camps and wandering through the merchants. Or perhaps you spend your days in the class tents. But this year my Pennsic friend isn’t coming and there are not any classes I want to go to. So it looks like I need to bring something to do or spend my days lounging. Of course, we are having a few visitors throughout the week that may appreciate a companion, so I’ll probably spend some time with them. It’s a mess, but it should keep me occupied. So far I’ve got two unfinished knitting projects; two spindles, one with stuff already going; odd balls of yarn for cuffs; and fiber to spin. I’ll probably bring it all home untouched. When I was at the Pittsburgh Knit & Crochet Festival last year, I stood outside the booth working on my drop spindle. It was a pretty slow weekend, so I got a lot of spinning done. Plus it drew people’s attention. One woman said to me as she walked by, “Wow. You have a lot of patience!” And I thought that was an odd statement. Here we are at a fiber show where every activity is rather time consuming. Sure, you could knit something tiny and it wouldn’t take too long. But generally speaking, it’s all rather slow work. Why did that particular activity seem so daunting to her? As I’ve been working through different aspects of my craft the past two weeks, I’ve really begun to realize just how slow and plodding it all is. 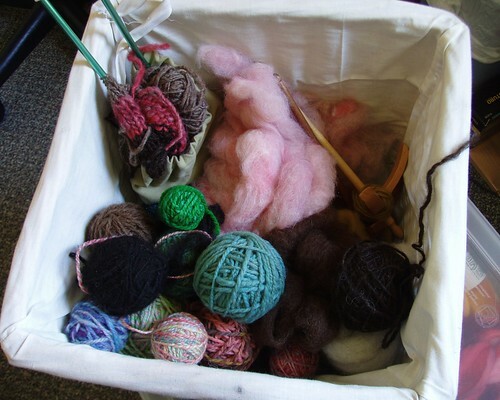 Last week I wrote up the steps involved in washing a skein last week. And yesterday I shared the details of my spreadsheets. Honestly, I’m not even sure which of all the steps takes the longest! For someone who wants everything immediately, I’m a bit surprised that I’m able to keep focused on any of these things. Question: What is the most time consuming activity that you do? Are you the type that likes long term projects or quick finishers? Is there any project or activity that you might see and think to yourself, “Ugh! That is way too slow for me! I wouldn’t have the patience to do that”? Last Saturday I spent the entire day at a table with a set of double pointed needles, two balls of yarn, and a Barbara Walker treasury. My plan was to make a pair of fingerless mitts (note: I was at an SCA event). I had everything I needed except an idea. That’s what the book was for — browse the stitch patterns and whip something up. It never happened. I cast on at least five or six different times, but still ended up with nothing. Eyelets, colorwork, ribbing, slipped stitches. After hours of work, there was still nothing to show for it. To say I was frustrated would be an understatement. Eventually on Sunday I settled on something: moss stitch body in green with 3×2 ribbing in orange. It’ll work. But what about next time? Question: How do you get inspired? How do you take something interesting and get inspired by it? What do you do to find inspiration? What does “inspiration” mean to you? Earlier this week I mentioned two unfinished pairs of socks that have been floating around in my mind since 2008. Apparently they are affecting me so strongly that I have been unable to knit any socks since then. I’ve knit hats and mittens and scarves and tea cozies and shawls. But no socks. I think there is a roadblock in my mind that is saying I need to wrap those projects up before I can embark on something similar. Or perhaps the fact that I failed on two counts makes me feel like I just can’t knit socks successfully, which is dumb since I’ve made four complete pairs in the past. So, I’ve decided to frog my mom’s sock (I didn’t get that far anyway). Someday I will use that yarn and start again with a different pattern. As for the cabled sock that was to be mine? It is very unlikely that I could make its mate to match at this point, so it will just remain as it is: one lone sock. I don’t want these two pairs of socks to continually prevent me from making new socks. They will no longer hold me down. Onward! Question: How do “UFOs” – unfinished objects – affect you? Do you feel obligated to finish one project before starting another? Do you have many projects going at once? What’s the oldest unfinished project you have still lingering? I have a burning desire to knit a pair of socks. I can’t say for certain the last time I actually successfully knitted an entire pair of socks. To Ravelry! Ok, wow. 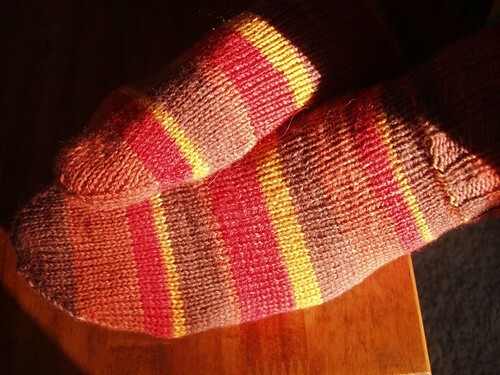 The last pair of socks I made were finished in 2008. 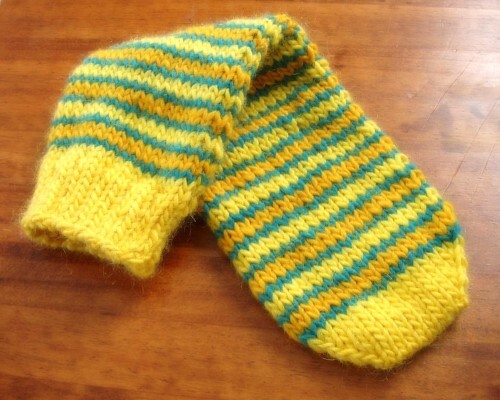 That was the self-striping pair for my dad, who still has not worn them out of fear of destroying them. Just this weekend we had everyone over for a birthday party and I told him how hardy handknit socks are. In fact, I told everyone that I tend to wear my socks for days (and nights) at a time! I think it grossed them out a bit. meh. Dad's first (and only) pair of socks. 2008. Other than that pair, I have two who are haunting me with their perpetual unfinishedness. 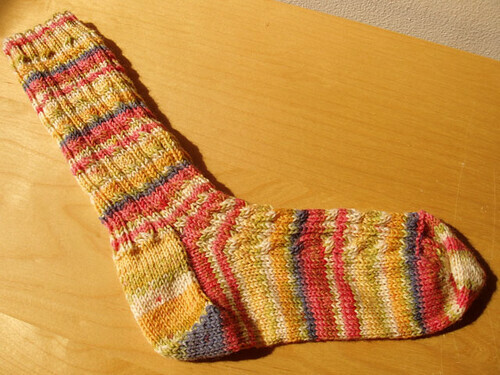 Also in 2008 I decided to join my first KAL, Summer of Socks. I got one sock completed for myself, but abandoned it to start a pair for my mother. I had selected two patterns that were more than just stockinette, and perhaps that was the key to my failure. 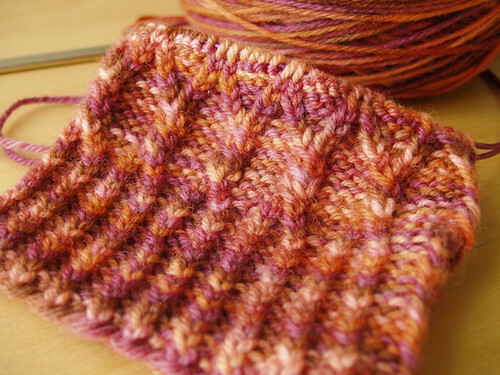 I could handle the cables on my pair, but the lattice on my mom’s sock proved too time consuming. Since this double epic fail, I have not tried to knit socks. Perhaps I felt that I needed to complete these projects before I could move on to a new one. I have decided they will remain UFO’s forever. Time to start fresh with a new pair! And nothing fancy this time. Half of a pair of socks for me. Cuff of my mom's sock (never finished). can you tell I’ve had a lot on my mind this week? I just can’t sit down to write about anything. my mom’s new hat is finished, but I don’t have a photo of it and now it’s at her house. there is a whole pile of lovely yarn to show off, but I don’t have photos of those either. everything just feels a little hectic and weird right now… even the house is a mess. the laundry is a week behind. every surface in the bathroom is covered in grime. at least i got all the dishes washed last night, but it wasn’t until 10:30 pm. sigh. i want this week to be over. This week I found myself leafing through past photos on Flickr. Mostly I was looking for inspirational color schemes for my logo. But as I was looking at the photos, I realized what a wonderful resource they were. 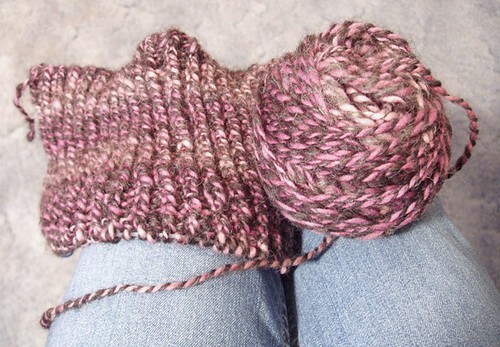 I signed up for Flickr in 2006; the first photo, a hat in progress, posted on October 29. Even though I haven’t documented every single project ever made, it still gives me a good idea of where I’ve been and what I’ve been doing. It’s also quite obvious just how bad at using a camera I was at the beginning. Not to say I’m awesome now, but certainly improved. Sometimes I even come across a project and I’m surprised that I made it! When I decided to set up the account, I felt very intimidated, that my pictures wouldn’t be good enough. But now, five years later, I’m very glad I took the chance. First photo on Flickr, Oct. 29, 2006. 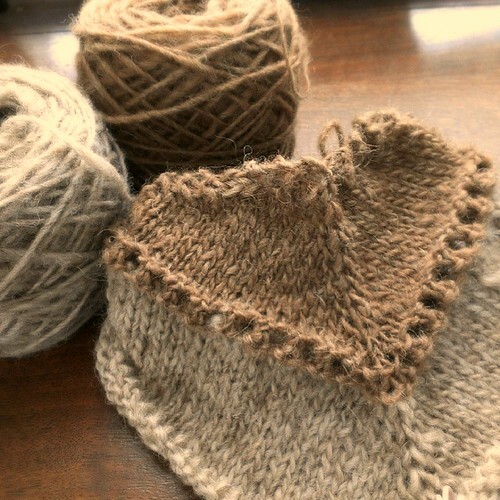 Hat in progress. On this date in 2010, I posted three photos of handdyed Romney roving. It looks like last November was generally pretty slow! Outdoor house projects and prepping for the Christmas sale. Question: How long have you had a Flickr account? Do you like to go back and look at past projects? What is the very first picture you posted (please include a link)? What was happening in your life at this time last year?